Hi ladies! I'm still in HK at the moment so there hasn't been much time for me to blog unfortunately. I've been catching up with family and basically eating nearly every hour of the day! Plus some shopping of course! 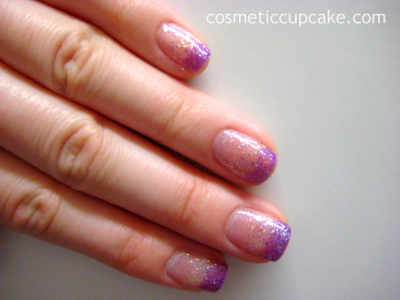 Here is a purple gradient manicure I did last week using a gradient kit I found here. 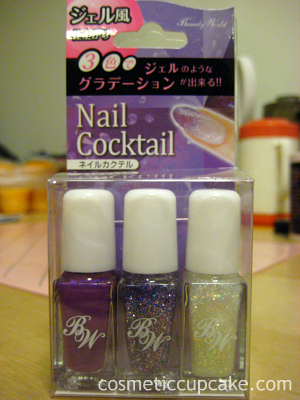 You get 3 colours in this purple kit - a dark purple, a purple/blue glitter suspended in a purple jelly and a clear glitter. Pretty simple huh? 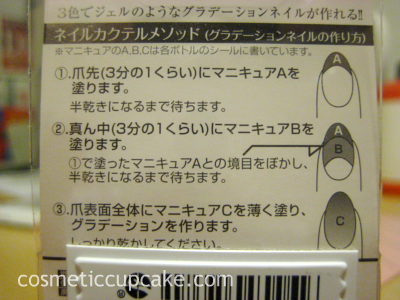 Just layer the polishes on following the instructions and add topcoat and it should look like below. 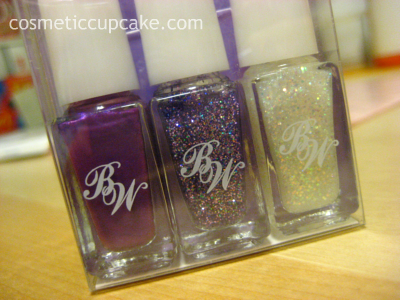 The polishes applied well and the brushes were good even though they are small bottles. Drying time was decent and I didn't have to wait too long in between coats. I don't think I did my mani very well though because it doesn't look very blended but oh well! On another note, I found a simple online photo editor called Picnik to edit photos while I'm here. It's no Photoshop and the lighting is still yellow but I just had to tweak and watermark my photos. Beautiful, here in Brazil does not have kits so. :) Wow that kit is so cute! I've never seen a kit like that. they look so great..i'd love to do such a mani too, but unfortunately we don't have such kits here in bucharest..
oooh that looks cool! ive always wondered how to do a gradient effect! that's really neat! i've never seen a gradient kit before. 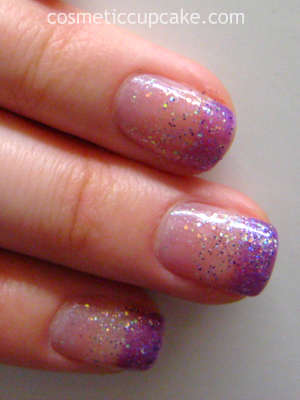 this gives me some ideas on how to do the glitter gradient i've been wanting to try. Thank you all so much for your wonderful and kind comments! 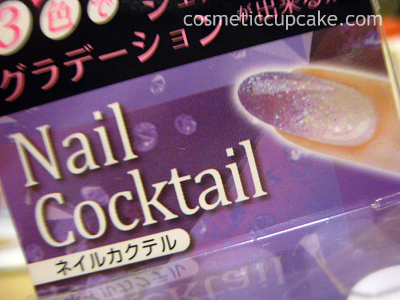 I'm so happy I found this kit as it made doing gradient nails SO EASY! If you do come across this set make sure you snap it up!